Once upon a time I struggled to fill my make up bag with colours and textures that would suit me, I do believe those days are now long gone. I will be the first to admit that compared to skincare “greener” make up still has a little way to evolve but I have an all natural make up bag that I am extremely happy with at the moment. 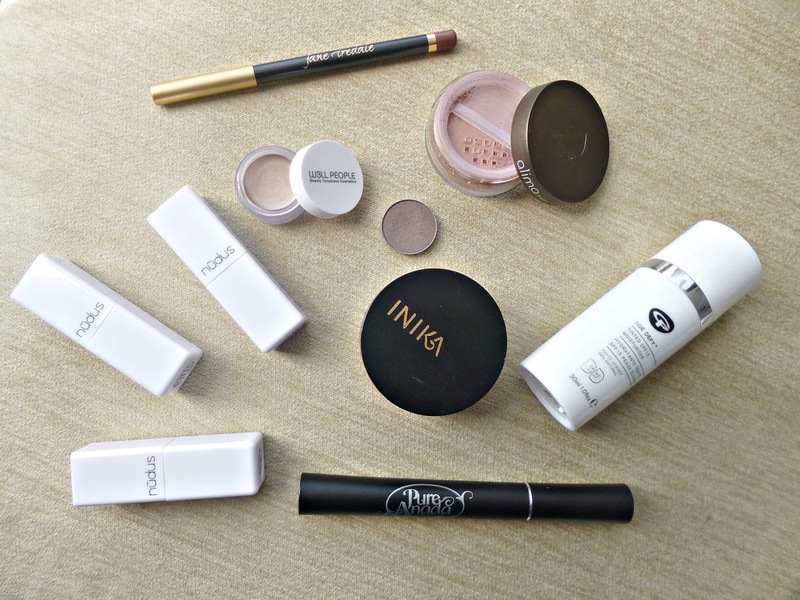 I thought I would show you a few items that are easy to use and apply and help achieve that polished but not trying too hard look. I have been giving Nudus Lipsticks a thorough test and I adore the formula, I have a full review with swatches coming up, but something that struck me about the colour selection was how flattering and classic the colours were. I do believe that there is a colour for everyone in the range but particularly lovely is 27 kisses which I know a lot of people adore, it is a warm colour that looks just lovely. As I have been making an effort to wear more lipsticks I have invested in a couple of lip liners to help with longevity, I had heard great things about the ones from Jane Iredale and I purchased spice and rose which work well with lot’s of colours, I am very happy with these and may invest in a few more. I am getting lazy with my eye make up, there I said it, who has time for crease colours and blending? I have been sticking to Kjaer Weis shadow in Wisdom which is such a classic and beautiful taupe that it is very hard to go wrong with it. I take a fluffy brush and go all of the lid with this, if I am feeling fancy I will add a lighter colour as well but really this colour has been the only one on my eyes for the last month. To top off the shadow the Pure Anada mascara has seriously impressed me, this Canadian brand has made a lovely formula. I have found it doesn’t smudge or flake (even in the heat!) and my lashes are fanned out and lengthened for a very pretty look, I love it! For a base that has a good amount of coverage but isn’t heavy I have still been head over heals in love with the Green People DD cream in the shade light (see full review here) I top it off with a light dusting of the Inika Mineral powder foundation which although pricey is always a staple in my routine as it lasts so long. I have the colour Unity and Nurture, Unity is lighter and Nurture is great for me with a tan. On the cheeks I have been reaching for this W3ll People Bio Brightener stick for a very pretty highlight, mine is just a sample size I received in an order but I can see the pot lasting ages, I actually wish more natural brands would offer smaller sizes to purchase, cream products are so hard to finish before they expire! This is a lovely cream, very similar in colour to RMS living luminiser but I actually prefer the formula of this one. W3LL people is a brand I haven’t really explored fully but hope to in the future. I have been operating a strict one in one out policy on make up, and after saying goodbye to my beloved RMS lip to cheek in smile I decided to go shopping for blush. I ended up with the Alima Pure luminous shimmer blush in the colour Freja and I love it! It is light and subtle with a pretty sheen, no glitter. It is a perfect flush of colour. I am very pleased with my first Alima purchase! So there you have some natural and organic products that are making me and my make up bag very happy! If you would like full reviews or swatches of any of these please do leave a comment below! Post contains some PR Samples and affiliate links, please see my full disclaimer for details.